Today, Intel and Micron announced the completion of an expansion to Building 60 (B60) at the IM Flash facilities in Lehi, Utah. The expanded fab will produce 3D XPoint™ memory media, a building block of Intel® Optane™ technology that includes Intel® Optane™ memory for clients, the recently announced Intel® Optane™ SSD 900P Series and new capacities and form factors of the Intel® Optane™ SSD DC P4800X Series. A ribbon-cutting was held at the facility with Utah Gov. Gary Herbert, employees of the facility and representatives from Intel and Micron. The IM Flash joint venture was created in 2006 to manufacture non-volatile memory for both Intel and Micron, starting with NAND for use in SSDs, phones, tablets and more. In 2015, IM Flash began manufacturing 3D XPoint™ technology, the first entirely new memory media in 25 years. The technology was developed to meet the quickly expanding data needs for all types of customers. 3D XPoint™ technology uses a crosspoint structure to deliver a cell and array architecture that can switch states significantly faster than NAND. 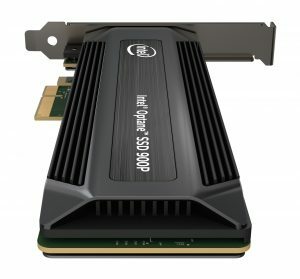 Intel recently announced the Intel® Optane™ SSD 900P Series for use in desktop and workstation PCs. It delivers incredibly low latency and best-in-class random read and write performance at low queue depths. Additionally, Intel expanded the Intel® Optane™ technology offerings for the data center, introducing 750GB capacity and 2.5-inch U.2 form factor versions of the Intel® Optane™ SSD DC P4800X Series. For details on these products and all Intel SSDs, visit Intel’s solid state drives website.